Bangladesh on this date in 2007 hanged six Islamic militants* for a terrorist bombing wave two years prior. Several were agents of the terrorist organization Jamaat-ul-Mujahideen Bangladesh, notable for a headline-grabbing coordinated bombing on August 17, 2005 that saw hundreds of explosions throughout Bangladesh. That organization’s chief Shaykh Abdur Rahman was among those executed on March 30, 2007, as was “Bangla Bhai” (Siddique ul-Islam), the leader of the Al Qaeda-aligned Jagrata Muslim Janata Bangladesh (JMJB). * Four different prisons were used for the executions. Shortly after midnight this morning — local time at Dhaka Central Jail — five officers who in 1975 assassinated Bangladesh founding father Sheikh Mujibur Rahman (and most of his family) were hanged for the crime. Justice so long delayed still tasted sweet to a celebratory crowd. That act was revoked after a generation’s military rule with the 1996 election of Mujib’s daughter Sheikh Hasina Wazed, who was lucky enough to be in West Germany when her family was slaughtered. 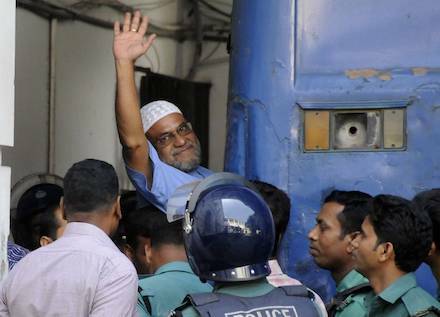 Even so, the case has had a tortuous path since through the Bangladeshi judiciary. Once it finally reached the terminus, the government did the hemp necktie routine with dispatch just this side of seemly. Only hours after the doomed men’s last appeal was turned aside, Lt. Col. Syed Faruque Rahman, Lt. Col. Sultan Shahriar Rashid Khan, Lt. Col. Muhiuddin Ahmed, Maj. A.K.M. Mohiuddin Ahmed, and Maj. Bazlul Huda were hanged. Their hanging does not close the book on the Mujib assassination. Seven other death sentences in absentia remain; six of those condemned are still alive, and at large abroad. Bangladesh is trying to get them back. 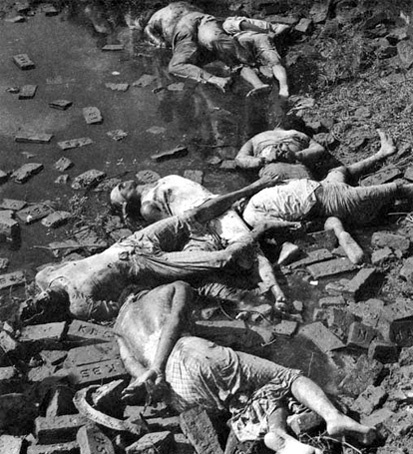 This date’s observance marks the systematic execution by (West) Pakistani forces of the intellectual class of East Pakistan at the end of the civil war which would detach the east as the independent nation Bangladesh — an unavenged war crime as cynical as it was brutal. Executed intellectuals in the Dhaka Rayerbazar, 1971. This was not a single discrete massacre, but a continuing policy during the March-December 1971 war. December 14, just two days before the Pakistani army surrendered, was the peak date of a dreadful endgame paroxysm that saw hundreds of scholars, teachers, lawyers, doctors, artists, writers, engineers, and the like rounded up and summarily executed in a bid to decapitate the new Bengali state’s intelligentsia. Though the martyrs were subsequently venerated in Bangladesh, the higher-stakes regional geopolitics have always made effective redress a nonstarter. Gorgeous pictures of another memorial. At 4 a.m. this date in Dhaka Central Prison, Lt. Col. Abu Taher was hanged for treason. A quick counter-coup of junior officers — also remembered as the “sepoy mutiny”* — mounted by leftist war hero Abu Taher on November 7 put Ziaur Rahman’s hand back on the helm of state. Abu Taher, a retired officer and a hero of the 1971 Bangladesh Liberation War that had detached the former East Pakistan from Islamabad, had visions of social revolution. But three coups in as many months is the sort of thing to rattle the new big man, and Zia consolidated his own power by eliminating threats to both left and right political flanks. A mere 17 days after doing that National Revolution and Solidarity thing, the guy with the mass movement (pdf) of armed men was arrested for treason. He faced a military tribunal the following year. Taher scorned the charges against him, but of course the fix was in. * An allusion to colonial history. 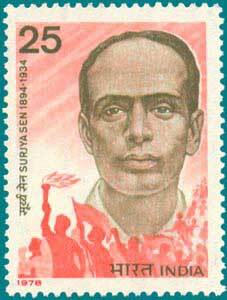 ** However, Taher’s own date of martyrdom is also still marked by his posthumous partisans.